This product has been discontinued as of Fall 2018. Can Glucerna products be used by an individual without diabetes? 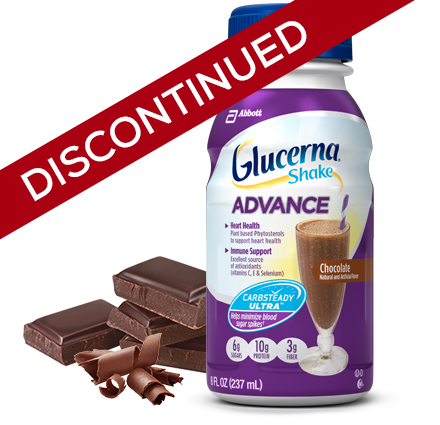 Individuals without diabetes can consume Glucerna products. Abbott Nutrition has many other options, such as Ensure, ZonePerfect, or EAS, for people without diabetes to integrate into their meal plans. However, Glucerna shakes and bars are specially designed for people with diabetes. Glucerna products are intended to be used under medical supervision to support the dietary management of diabetes. The Glucerna portfolio contains blends of carbohydrates which include modified maltodextrin (a portion of the maltodextrin has been modified so the body is not able to digest it), fructose, maltitol, soy fiber and fructooligosaccaharides. This helps minimize the peak in blood glucose. This carbohydrate that is not digested may be fermented in the large intestine. These ingredients, in combination with the other carbohydrates listed above, produces a lower blood glucose response compared to a higher glycemic carbohydrate. Refer to individual product labeling for specific ingredient information. Ingredients will vary per product and flavor. Water, Corn Maltodextrin, Milk Protein Concentrate, Sucromalt, Glycerine, Cocoa Powder (Processed with Alkali), Soy Protein Isolate, Fructose, High Oleic Safflower Oil. Less than 1% of: Canola Oil, Soy Oil, Plant Sterol Esters, Magnesium Phosphate, Potassium Citrate, Salt, Natural & Artificial Flavor, Choline Chloride, Calcium Carbonate, Ascorbic Acid, Calcium Phosphate, Monoglycerides, Soy Lecithin, Carrageenan, Liquid Sucralose, Potassium Hydroxide, Potassium Chloride, Acesulfame Potassium, Ferrous Sulfate, dl-Alpha-Tocopheryl Acetate, Zinc Sulfate, Niacinamide, Calcium Pantothenate, Chromium Picolinate, Manganese Sulfate, Cupric Sulfate, Vitamin A Palmitate, Pyridoxine Hydrochloride, Thiamine Chloride Hydrochloride, Riboflavin, Folic Acid, Biotin, Sodium Molybdate, Potassium Iodide, Sodium Selenate, Phylloquinone, Cyanocobalamin, and Vitamin D3.